When I look around the living room I see a lot of Easter paraphernalia.. Wooden eggs, candle-eggs, bunny-miniatures, chick miniatures etc. In short, my girlfriend loves to decorate the house because it is almost Easter. I just like to sit and relax in my chair while smoking. I don’t have much up with religion and holidays, except for the days off of course. But I like the tradition, the history. 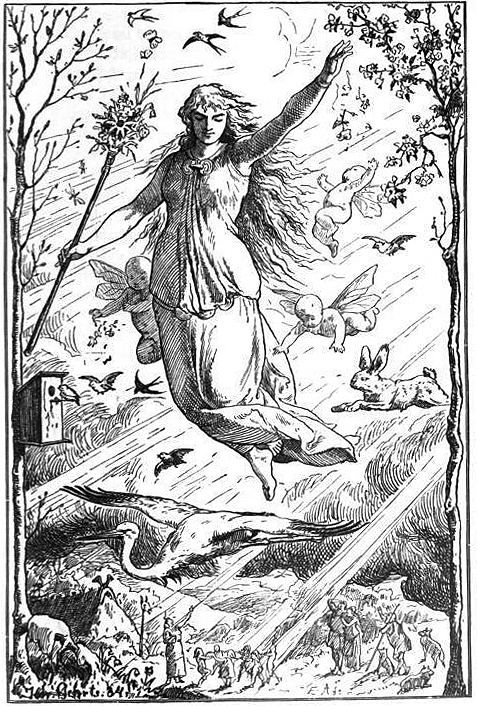 The ancient Saxons celebrated the return of spring with a festival in which they commemorated their goddess of offspring and springtime: Eastre (or Ēostre / Ostara). In the 2nd century Christian missionaries encountered the tribes of the north with their pagan celebrations. In a clandestine manner they attempted to convert them to Christianity. It would have been suicide for the very early Christian converts to celebrate their holy days with disregard to the celebrations that already existed. To save lives the missionaries cleverly decided to spread their religious message slowly throughout the populations. They allowed them to continue celebrating pagan feasts, only in a Christian manner. The pagan festival of Eastre occurred at the same time of year as the Christian resurrection of Christ. So it made sense to alter the festival itself by making it a Christian celebration. This way converts were slowly won over. 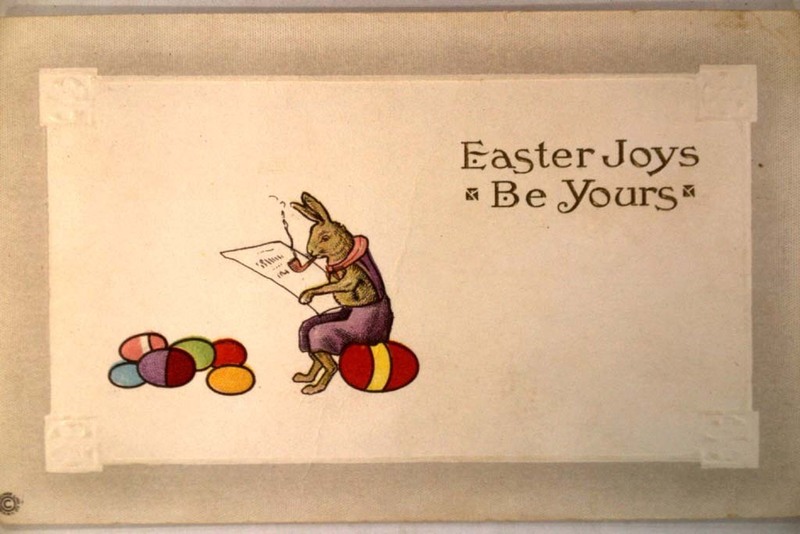 The early name, Eastre, was eventually changed to its modern spelling: Easter. – Palm Sunday: The Sunday before Easter Day. It is to commemorate the last journey of Jesus to Jerusalem. People then cut palm branches to spread on his path as he rode to the city. – Holy Thursday: Here in Europe Christian monarchs used to wash the feet of poor people on the Thursday before Easter. This in memory of Jesus’ act. The new pope Francis breathed new life in this tradition. Also on this day Jesus ate and drank with his followers. This meal became known as the Last Supper, because Jesus died soon after. – Good Friday: The commemoration of the trial and crucifixion of Jesus. I can remember eating meat was not allowed by my parents on this day. So we just had fish or bread. – Holy Saturday: Part of the mourning period which begins on Good Friday. Also a day of cooking and preparing for the feasting the following day to celebrate the resurrection. – Easter Day: The commemoration of the resurrection of Jesus. Of course a symbol of that is the egg out of which a bird hatches. And a lot of eggs are eaten during the feast that day. 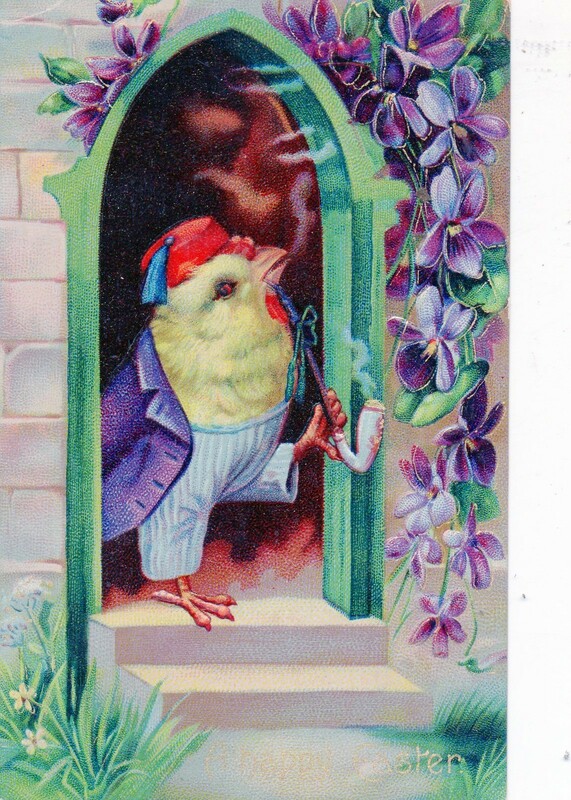 – Easter Monday: The ideal day to get up late and relax. Here in Holland a lot of people go to furniture mega-stores which are open. – Ascension: The 40th day from Easter day on which Jesus ascended into heaven. 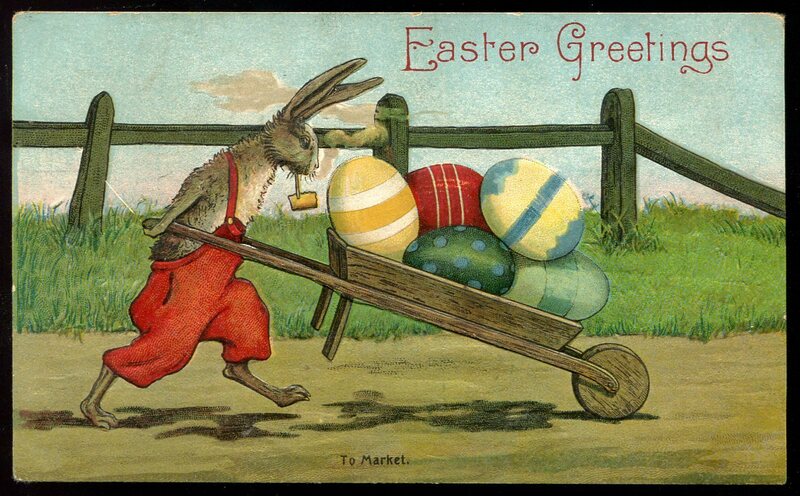 The Easter bunny is not some modern invention. The goddess Eastre (see above) was worshipped through her earthly symbol: the rabbit. The hare and the rabbit were the most fertile animals known and they served as symbols of the new life during the spring season. 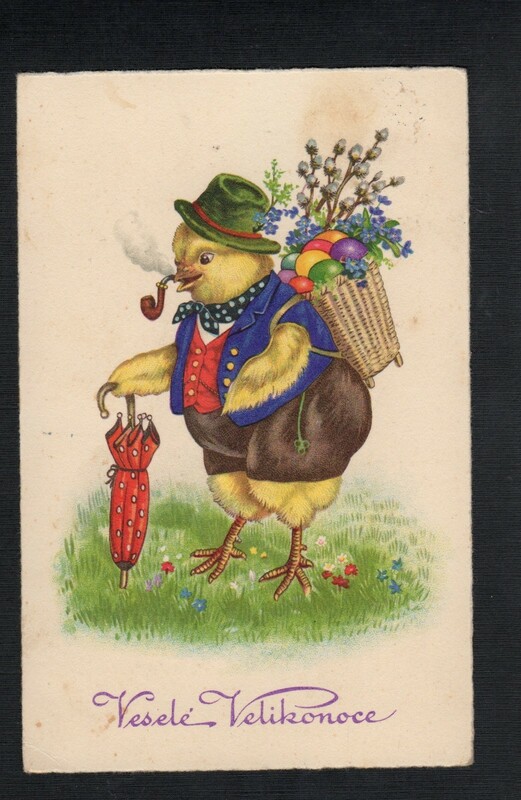 The Germans brought the symbol of the Easter rabbit to America. 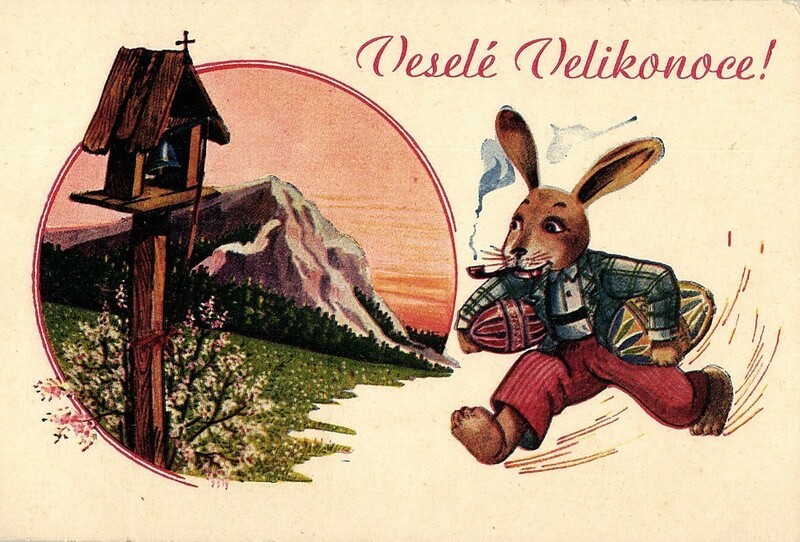 The bunny as an Easter symbol seems to have its origins in Germany. It was first mentioned in German writings in the 1500’s. 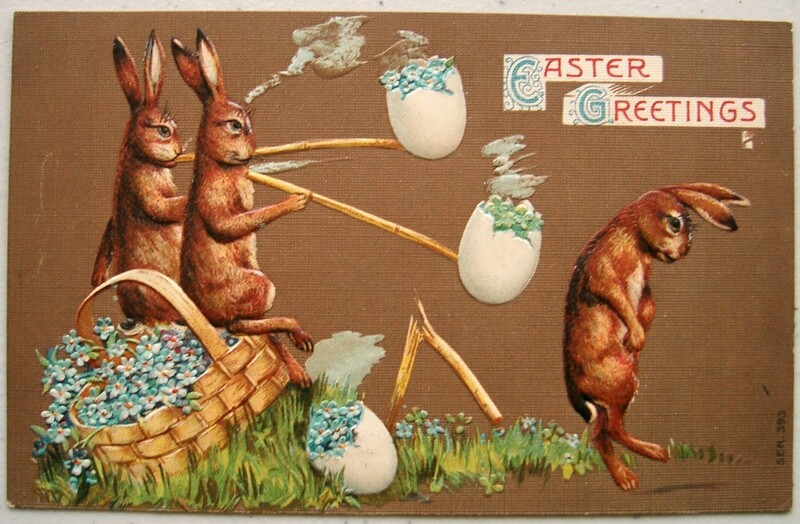 The first edible Easter bunnies were made in Germany during the early 1800’s. Not of chocolate but of pastry and sugar. 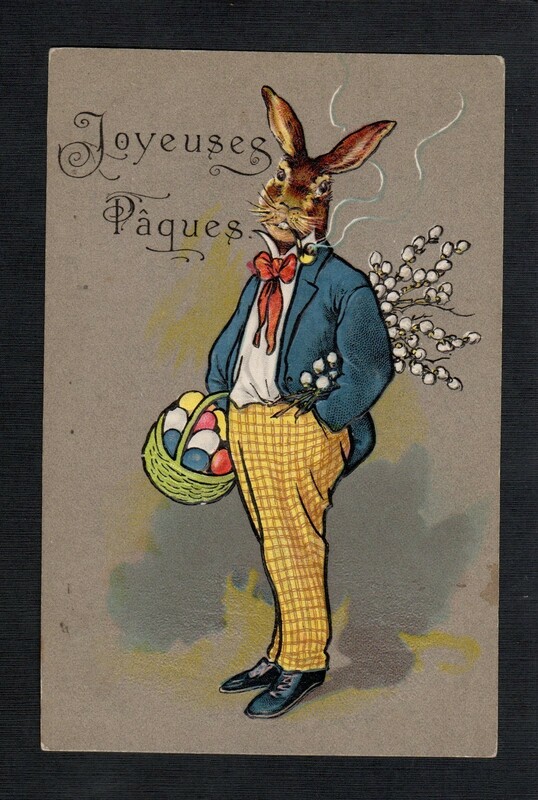 German settlers believed that a white hare would leave brightly coloured eggs for all good children on Easter morning. So early American children built nests of leaves and sticks in their gardens. 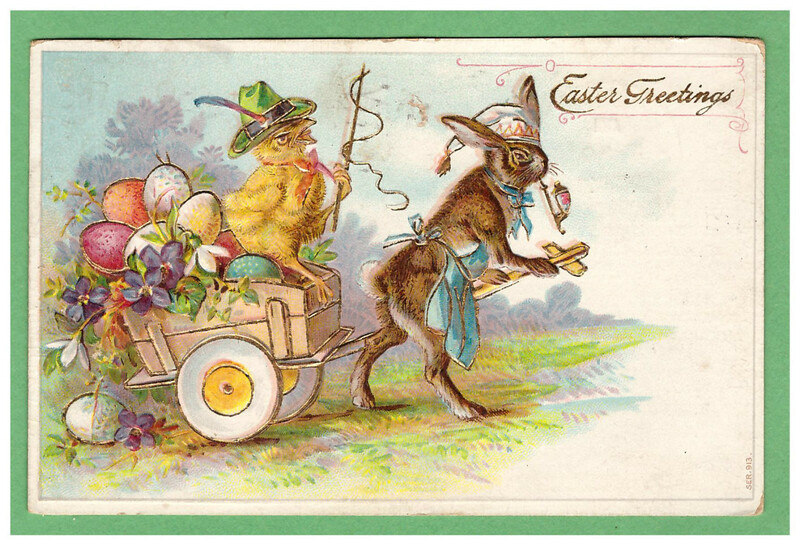 This way the Easter hare could fill it with coloured eggs. 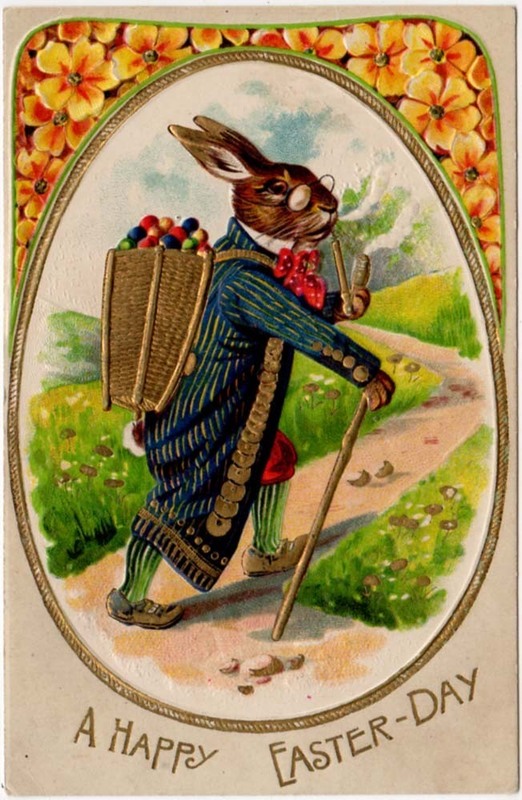 By the 19th century the Easter hare had become the Easter bunny. 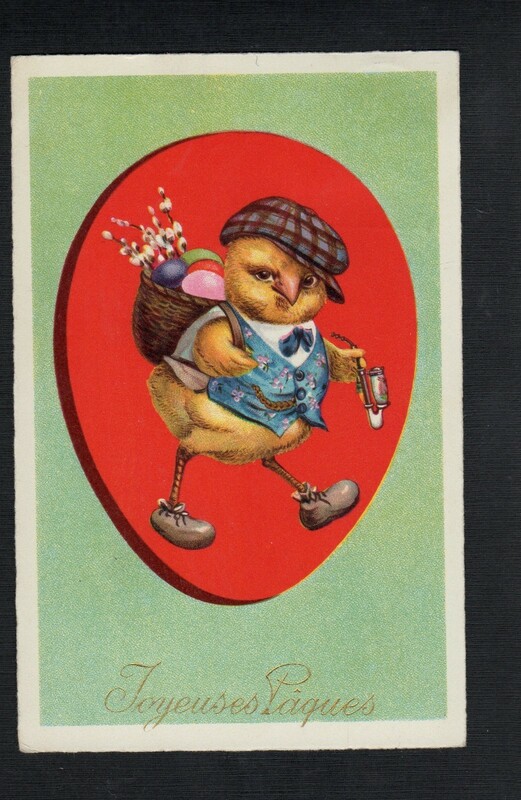 Children were spoiled with baskets of eggs, chocolates, candy chicks, jelly beans and other gifts on Easter morning. 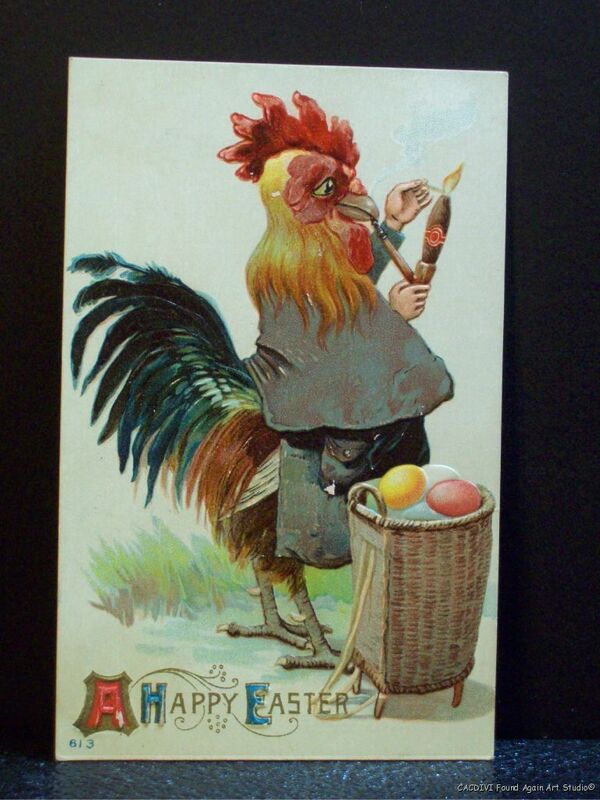 By the way, originally Easter eggs were painted with bright colours to represent the sunlight of spring. 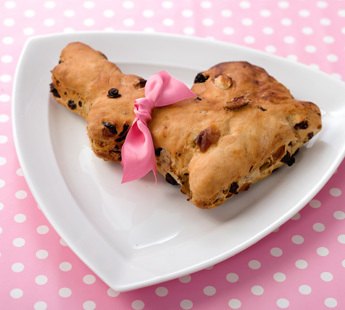 Here in Holland Easter Day is known as “Paas-zondag” and there is a special Easter meal. Often the table is decorated with coloured eggs and so called “Paasbrood”, which is a sweet bread with raisins. In my youth my parents also hid chocolate eggs throughout the house. I had to search them and when I got near a hidden egg my parents would say “hot!” When there was no egg where I was searching they said “cold!” Needless to say that in my later years I knew all the secret hiding spots. 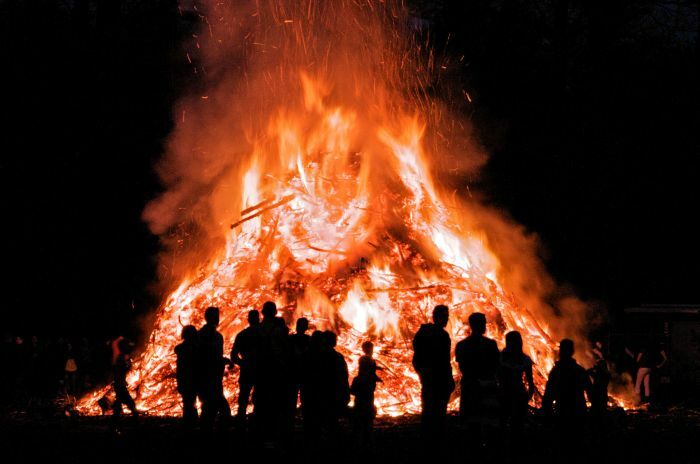 Nowadays I live in the east of the Netherlands where almost every village lights an Easter bonfire on some grass-land. People begin collecting wood for the fires weeks in advance. Often that wood exists of old Christmas trees. Of course each village tries to outdo the others by building a bigger and better fire than its neighbours. 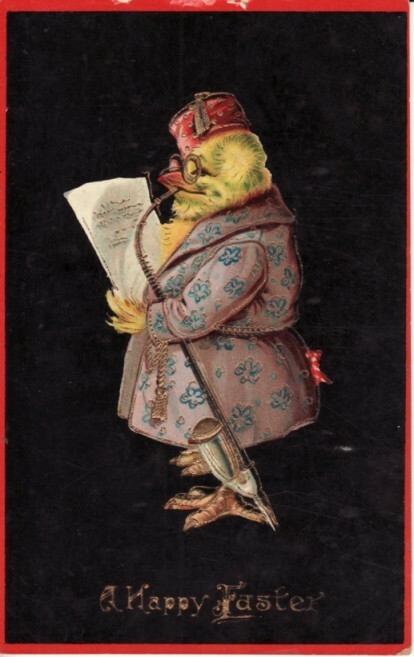 Last but not least; where does the pipe smoking bunny comes from that is depicted on many old postcards? Simple: Anthropomorphism. Say what?? Anthropo- morphism is the attribution of uniquely human characteristics to non-human animals or objects. 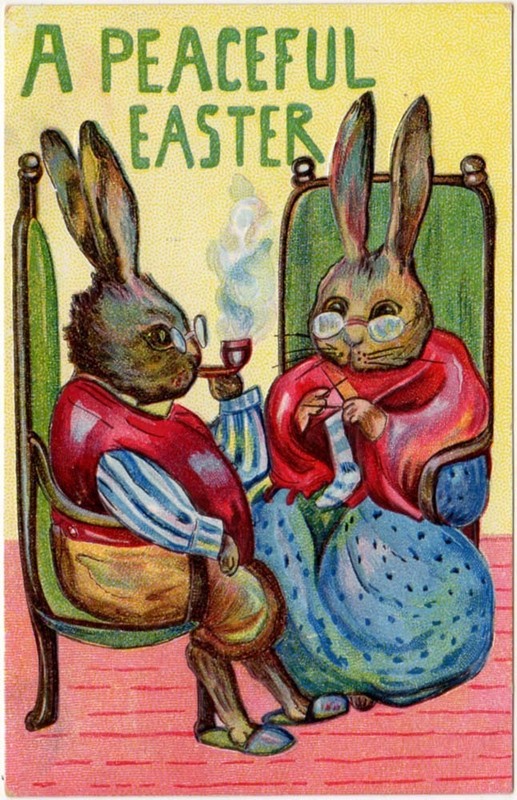 Rabbits on Easter greeting postcards were often given human characteristics such as being portrayed as wearing clothing and smoking pipes. So relax, smoke a pipe and have a good meal. Happy Easter! Excellent! Thanks! i’m going to post it on fb.